Behind three home runs and a complete-game shutout from right-hander Konner Wade, the Sugar Land Skeeters picked up a 10-0 win over the Long Island Ducks in Game 2 of the Atlantic League Championship Series on Wednesday night at Constellation Field. The Skeeters now lead the best-of-five series, 2-0, and will head to Long Island for Game 3, along with Games 4 and Game 5, if necessary, with first pitch on Friday at 5:35 p.m. CT.
Wade struck out 11 batters without surrendering a walk and allowed seven hits in his shutout effort, which was the first complete-game shutout from a Skeeters pitcher this season. The 11 strikeouts also matched the Skeeters’ single-game franchise record, which has been done on two other occasions. Left-hander Kelvin Villa accomplished the feat on September 13, 2012, against the Somerset Patriots and right-hander Barrett Loux struck out 11 batters on May 3, 2016, against the New Britain Bees. The Skeeters jumped out to a 4-0 lead in the third inning off Long Island starter Matt Larkins on a sacrifice fly from shortstop Juan Silverio, an RBI single from Matt Chavez and a two-run double from Tony Thomas. Sugar Land has now won four straight postseason contests dating back to Game 4 of the Freedom Division Championship Series against the Lancaster Barnstormers. 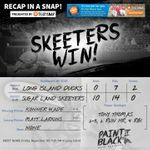 Wednesday’s win was the only game during the winning streak that the Skeeters scored the first run of the game. Sugar Land native Barrett Barnes belted the first of two solo homers in the fourth inning, with his second solo shot coming in the sixth inning. He became the second player in Skeeters history with a multi-homer game in the postseason, joining Delwyn Young, who did so on October 3, 2014, in Game 3 of the American League Championship Series against Lancaster. Thomas continued his superb postseason with a two-run homer in the seventh inning, which gave him two home runs and an Atlantic League-leading 10 RBIs in the 2018 playoffs. Chavez and Albert Cordero put the finishing touches on the win, each delivering RBI singles in the eighth inning. With the win, the Skeeters are now 4-0 against Long Island all-time in the ALCS. The last time the two teams met in the ALCS was in 2016 when the Skeeters won their first-ever Atlantic League Championship. Skeeters right-hander Lucas Irvine (1-1, 2.55 ERA) will take the mound for Game 3 at Bethpage Ballpark and will be opposed by Long Island right-hander Lorenzo Barcelo (0-1, 7.50 ERA). A live radio broadcast will be provided on SkeetersRoad.com and SugarLandSkeeters.com, and fans can also follow the team on Twitter (@SL_Skeeters) for live updates throughout the contest.